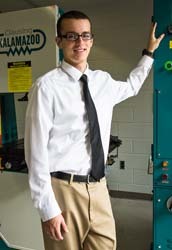 Last fall, Babcock became the college’s first STIHL Scholar, earning him $5,000 from STIHL Inc., the Virginia Beach-based manufacturer of outdoor power equipment. He was also named to the Phi Theta Kappa All-Virginia Team in April. Babcock credits engineering faculty members Stephen Ezzell and William Simmons, as well as Doug Thiele, English professor, for his academic success. Babcock served as the student speaker for the dedication of the Precision Machining Laboratory on the Chesapeake Campus, sharing his story with industry representatives, community members, faculty, staff and students. “Looking back it’s surprising to see how far you can go – especially with the help of faculty and the students at TCC,” he told them. Babcock is founding president of the Science and Technology Club at the Chesapeake Campus, a chemistry tutor in the Learning Assistance Center and a former senator for Student Government Association.